1941. France asleep in the nineteenth century, governed by steam and Napoleon V, where scientists vanish mysteriously. Avril (Marion Cotillard), a teenage girl, goes in search of her missing scientist parents. Based on the work of Jacques Tardi. 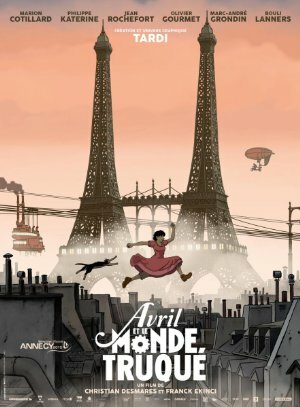 Brian Tallerico (RogerEbert.com): "It feels somewhat clichéd to call an animated adventure film a “delight,” but it’s the best word for the latest from GKids, “April and the Extraordinary World,” a joyful, accomplished movie that echoes “The City of Lost Children,” “The Adventures of Tintin,” “Metropolis,” “Howl’s Moving Castle” and something unique into a, well, delightful piece of work. More directly (and accurately) translated from French as “April and the Twisted World,” this Paris-set, alternative-universe adventure from co-directors Christian Desmares and Franck Ekinci is so remarkably fluid that it almost feels effortless. It’s a film that values intelligence in an increasingly scary world, and that’s a theme that works for any generation and in any language." Noel Murray (AV Club): "There’s an appealing simplicity to this film, which doesn’t make a big deal out of its exotic version of the 1930s and ’40s—not even when the heroine visits a fun-fair where the Ferris wheel cars are miniature hot-air balloons, and gas-masked couples dance on a rotating carousel. The fantastical is framed as commonplace, because that’s how April herself experiences it." Oleg Ivanov (Slant): "By showing the first world developing in a manner that we normally associate with the third, April and the Extraordinary World forces us to reconsider our critical attitude regarding the costs of the latter's socioeconomic development, leading one to view the third world's troubles in a more sympathetic, and thus politically productive, light. And by highlighting the conditional and fleeting quality of energy sources and their exploitation, the film causes us to question the shelf life of our current energy technology, giving us hope that future scientific breakthroughs will one day make our current era seem as antiquated to future generations as steampunk's alternative vision of the fin de siècle looks to us now." Kyle Anderson (Nerdist): "The movie feels at once like an all-ages adventure and like some kind of satire for adults. There is a bit of gunfire and blood, but it’s not gratuitous by any means. And we really start to love spending time on this adventure with April and Darwin, and later Julius, and later Pops, and there’s always something new to look at, whether it’s a house on legs that swims like a frog or a giant flying contraption or an underground terrarium for lizards in robot suits (yes, there are lizards in robot suits)." An interview with Franck Ekinci and Christian Desmares. This really is a lovely film. The animation is vivid and it really brings alterna-Paris and the rest of its world to life. The backgrounds are rich and as worthy of attention as the foregrounded characters, providing ample suggestion of consequences beyond the scope of the immediate story. Some of the reviews above are suggestive of that, mentioning how we might extrapolate some meaning from its view of destruction in the name of consumption. The humor of the film too is worth noting since it tends to spring from unintended consequence of acting, often acting out of violence, causing those who do act without thought to suffer greater humiliation and pain than those acting out of awareness, The suggestion that the movie through that places a high value on intelligence and care seems pretty spot on to me. The imagining of the world and the devices in it is often ingenious. It's, of course, clearly related to other Steampunk works, but has its own vibe when it comes to the look of the machinery and architecture of the period. The color range of predominantly greys, blacks, and browns with red and the occasional blue and green for highlights is pleasing, providing a nice balanced design for the production in the cityscapes that is set against the more vibrant colors of the artificial jungle area where the colors pop more and rightly seem a bit more otherworldly due to that. The women in the film fighting to preserve life, as opposed the men, working for more for conquest of knowledge, power, or people was a nice element, though the world suggested by the ending was a little too much like our own to provide any extra enthusiasm for how things worked out here on Earth other than a new Democratic Union and clean oil? It should go without saying that having a talking cat is reason enough to see the movie, though they could have given him a little better finish than they did. Watching this movie was a delight and our science lady protagonist's nose is bigger than her eyes but not in an outlandish way, just a NORMAL person face way, which was utterly refreshing compared to the aesthetics of most modern animation. I loved the animation, and the humor, storytelling, and characters all felt slightly foreign in a way that made me pay a bit more attention. Great movie.